This spacious 5 bedroom home has just undergone a major luxury upgrade (Fall 2013) and provides the ultimate in luxury vacation accommodation. Natural stone travertine and hardwood floors, granite counter tops, stainless steel appliances and chic furnishings add to the feeling of contemporary elegance. 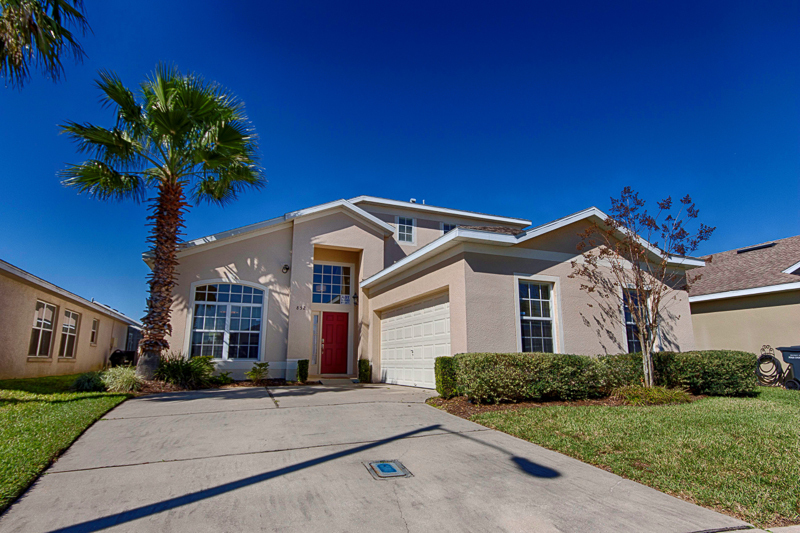 Hampton Lakes is conveniently located off HIghway 27 approx 15 mins from Walt Disney World Resort and close to a variety of shops, bars, restuarants and some great golf. This is a wonderful vacation home for the family or group wanting luxurious and spacious accommodation over two floors. The open plan ground floor is finished with natural stone travertine and begins with the formal dining space at the front of the home. The dark wood, rectangular table seats eight in comfort and is located next to the new designer kitchen, where the chef in your party can show off his or her skills. Granite counter tops, stainless steel appliances and all the pots, pans, glassware needed to cater for your party are provided. At the rear of the ground floor the elegant, contemporary family room is the ideal place to kick back and relax after a busy day at the parks or on the golf course. This area is equipped with a large flat screen TV and DVD player. Wireless internet is provided for those wanting to surf the web or stay in touch with friends or work. Sliding glass doors lead directly from the family room to the pool deck. 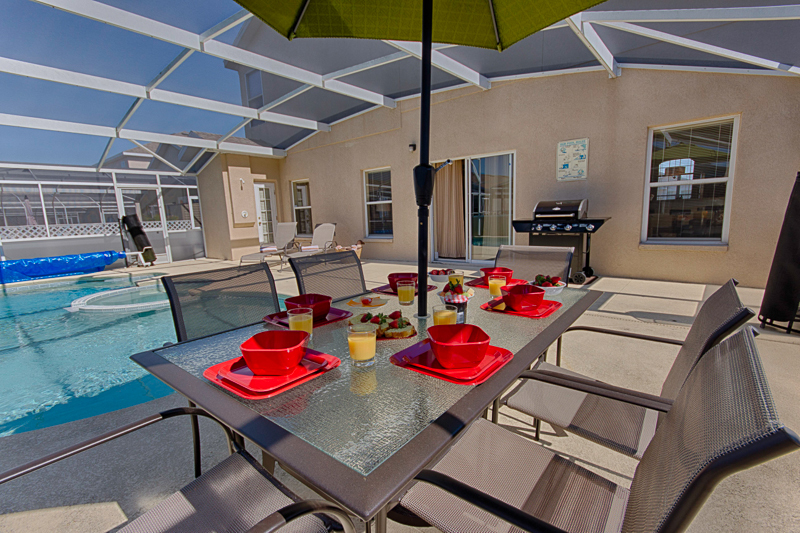 For casual dining there is a breakfast bar in addition to outside patio dining. Bedroom accommodation begins with a Queen Bedded Master Suite at the rear of the ground floor. Light wooden floors, a leather accented bed and dark wood cabinets and flat screen TV with DVD complete the space. The spacious private bathroom has a corner bath, walk in shower plus twin vanity basins with granite surround and dark wood cabinets. A second Queen Bedded Master Suite is located near the front of the home. This room is finished in similar style and also enjoys a flat screen TV. Upstairs the bedrooms are all twin bedded for maximum flexibility. 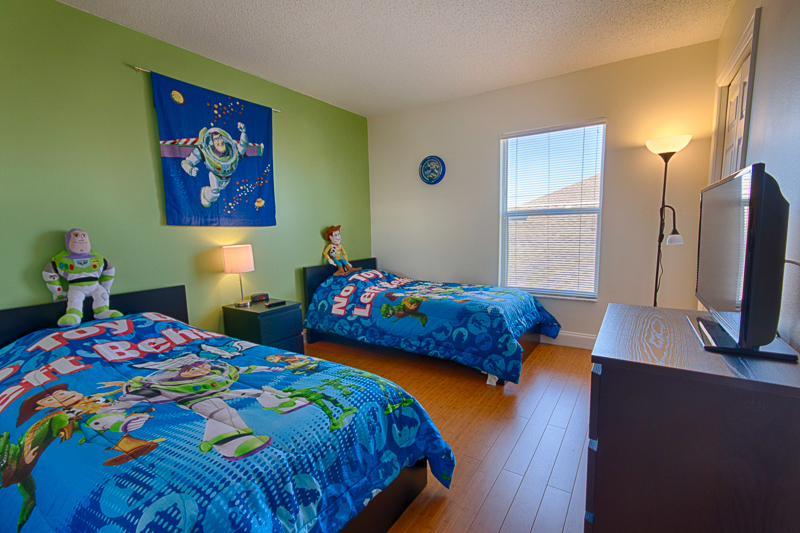 For the boys the Toy Story room is decorated with themed linens and soft toys of Buzz Lightyear and his friends. For the girls the Princess themed room is swathed in pink and features images of Disney's favorite fairy tale characters. 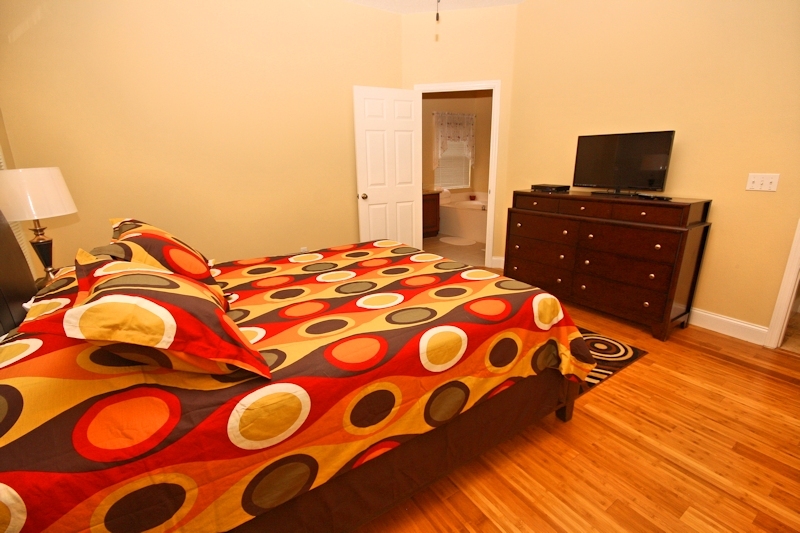 The third twin bedded room is finished in Fall tones with leather bed heads and dark wood cabinets. All rooms have a flat screen TV to enjoy the many cable channels on offer. The competitive in your party will love the game room, equipped with a full size table tennis table and foosball. Florida is all about outdoor living. The large pool and deck provide the opportunity to have a relaxing swim, soak up the sun or enjoy an alfresco meal at the patio dining table. A new solar pool heating system has just been installed (Dec 2013) so there are no extra charges for pool heating. Hampton Lakes is an exclusive development of luxury homessituated on Highway 27, just off the US 192 and 15 minutes from Disney. It is a prestigious, private community set amongst the gently rolling hills and orange groves of Northeast Polk County. The Resort offers easy access to Interstate 4 (less than 5 minutes), which will take you to the beautiful white sandy beaches of the Gulf Coast or Westwards to Daytona Beach, Cocoa Beach and The Kennedy Space Center. Orlando International Airport is only 35 minutes away. 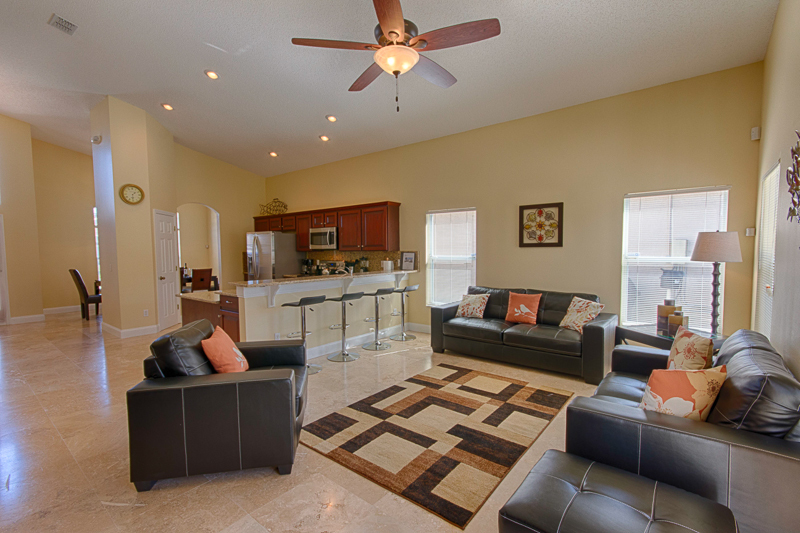 Hampton Lakes offers luxury villas to rent in Davenport Florida, built around two central lakes, while away an afternoon by your own private pool watching some of the Florida wildlife out on the lake. 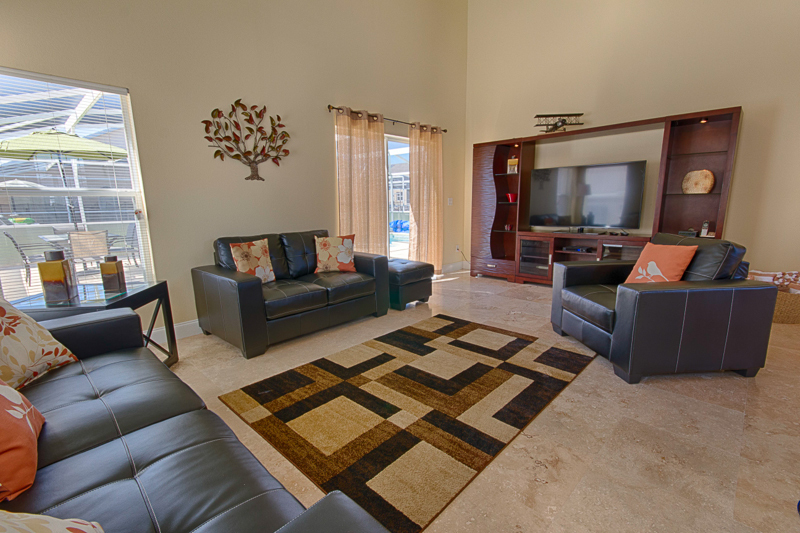 Hampton Lakes is located just off HWY27 and only 15 minutes from Disney World, Orlando. As you enter Hampton Lakes and navigate round one of very few roundabouts in Orlando, you will see the community pool and tennis courts, both free to use by guests on the community.